Hey -- have you joined the Treasure Hunt? Check out Monday's post for details -- you could become a Junkie for Life! Treasure Hunt: Junkie for Life! So Glad you're here! Hopefully, you are on the last stop of the Treasure Hunt. If you are stopping here first, you really need to follow the Hunt starting at the Technique Junkie Design Team blog (http://techniquejunkies.blogspot.com). 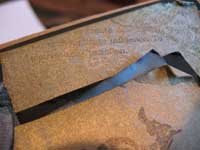 At each blog in the Treasure Hunt, you will pick up a letter -- and when you are done, you will come back here and leave me a comment with what you have found. The winner of the Treasure Hunt will become a JUNKIE FOR LIFE! If you win, that will mean that all of the past and future materials are yours. CDs will automatically show up at your door. Issues will appear like magic. WooHoo! Let me tell you a little about the card above. 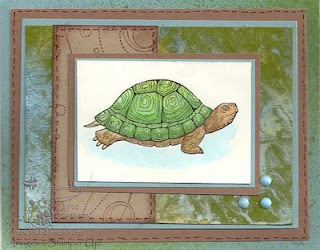 My card uses a morphed version of the Starch Smoosh Technique, one of the 16 new techniques inside the August 2009 edition of the Technique Junkie Newsletter. When I morphed my card, I used colored cardstock in place of the glossy cardstock the technique calls for -- and it has a smashing result!! I used a stamp from Stampin' Up! 's Nature Nest Collection, and paired it with a SU Wheel, too. Okay, no more turtling around! Leave me a comment at the end of this post with what you have collected on the Treasure Hunt. I will pick a winner when I return from CHA and vacation on Monday, August 3rd. Good Luck! Don't forget to surf on over to our Treasure Hunt TOMORROW too! You can become a Technique Junkie for LIFE! Details on the Treasure Hunt are HERE. See you tomorrow, Dude! Christmas in July - in more ways than one! First, about my Christmas card: I used a Warhol-esque Technique (February 2005 issue of the Technique Junkie Newsletter) on my Triple Play Card (February 2009 issue of the TJNL). 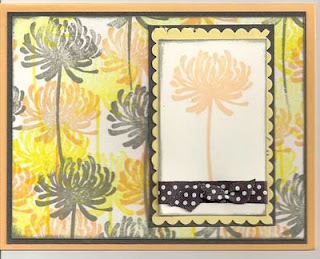 I used my new Holiday Punch hostess set from Stampin' Up!. I just love that little set -- so many possibilities! Now for the REAL Present! Starting on Monday, the Technique Junkie Newsletter designers are hosting out own Treasure Hunt. The Grand Prize is Technique Junkie for LIFE! One lucky winner will receive all the back issues and CDs that they do not have -- AND will receive all CDs and paper issues in perpetuity! How is that for Christmas in July! Our Treasure Hunt starts on MONDAY, July 27th at the Technique Junkie Designer Blog. You will collect things along the way and end up here. Don't worry -- I will have the link here to the starting point again on Monday, if you forget where to go. And there is a tab to take you there at the top of my blog, too. I will be at CHA on Monday, since I am the Guest Demonstrator for Copic Markers at CHA in Orlando! So if you have any questions, please email Chris Dickinson, who is our Treasure Hunt coordinator. I hope you will all play along! Merry Christmas! Phresh Fish anyone? 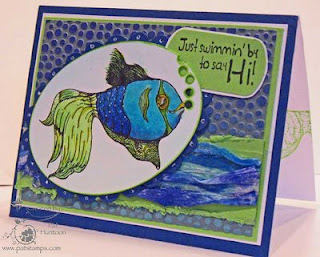 That is Phresh, with a PH, because these fish from Firecracker Designs by Pamela are Sassy! The card I made from the stamp sheet below uses a Cuttlebug Highlight Background (October 2008 Technique Junkie Newsletter) as a base for my Fish (which was colored with Copic Markers). I created a little wave of blue from some white mulberry paper I had, and even added some Heavenly Holes (June 2009 TJNL) for my friendly fish's air bubbles. Here is the whole stamp sheet -- it is just swimming with images and sayings! PreOrder!! 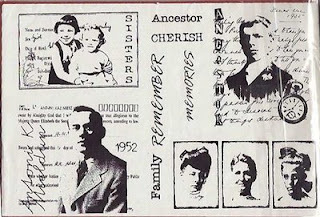 For a VERY limited time, FDBP has 2 new half sheets (5.5x8.5") sets up as a preorder special! Each set is regularly $12.99, but for this special, you can get them for $10.99 each. To order, and read the details click here! Don't forget, USA orders over 75$ in merchandise, receive FREE SHIPPING. TJ members save 10%!! Coupon code: ILOVETJS in the box at check out! To win this set and card, simply leave a comment by Saturday, July 25th at 9am est. The winner will be selected on Saturday. Make sure that you leave enough information so that I can contact you to let you know you won. Just a reminder that Blogger does NOT leave me your email address. A great way to do this is to leave your email address in a spelled-out way, such as "p huntoon at optonline dot net." I will use my handy random number generator to pick the winning entry. You do NOT need to be a TJ subscriber to win. Good Luck! I am on an egroup where there are some pretty ferocious RAKers. There is a virtual "hotel" and each floor has a theme -- I am on the diet and exercise floor. As such, I was recently "RAK attacked" by another floor -- I made and mailed this card to the participants of the floor that "attacked" me. "A public service announcement from the Diet and Exercise floor: Those who Indulge, Bulge." In any case, I used my copics to color my lady and layered her over a Cuttlebug Highlight background (October 2008 TJ Newsletter). The woman stamp is from the Great American Stamp Store, and the candy bar stamps are from Stamp Camp. I admit it. I have a "thing" about chicken stamps. Not that I am in love with the animal - I actually think they are a little vile in real life (have you ever been PECKED by one?) and I apologize to any of you who take umbrage with my revulsion. I just think there is something "homey" ("homey as used by adults, not my 15 y/o old) about chicken stamps. 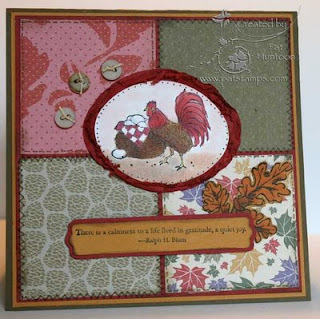 I am not a "country" kind of gal -- more suburban to be sure, but I do love a good chicken stamp! 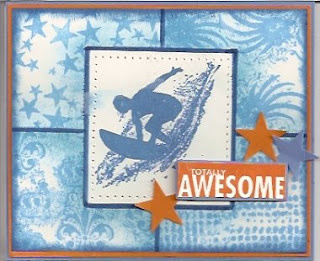 Now, that being said, this is a brand new stamp from Stampin' Up! from a hostess set called Country Morning. Today's Blogger's Challenge was to use stitching on our creations. Mine uses Faux Stitching (from the April 2006 Technique Junkie Newsletter), since -- I don't sew anything but buttons and hems with a needle and thread. I think it goes pretty well with the country theme I have going on! My chicken was colored with Copics and layered on a Torn Frame (December 2008 TJNL). This was layered over Autumn Traditions DSP. I used the Falling Leaves set behind the label punch. Oh -- I forgot! The label punch is not normally this long -- I actually took pictures of how I did this, and I will post them on Sunday (they are on a camera that my DH has, currently, at boy scout camp). In any case, I am sorry to babble on! Have a nice weekend! If you have never seen the wonderful selection of stamps on the Stamp Attack UK site, then you are in for a treat! Stamp Attack UK is today's giveaway sponsor, and I am proud to reacquaint (or introduce) you to this outstanding stamp company. Now I know what you are thinking. A stamp company in the UK? You are going to be pleasantly surprised! Stamp Attack's stamps run the gamut from elegant to cute (just LOOK at those birdhouses on the front page of her site!!!). The set we are giving away today is a vintage set (below). For my card, I used these stamps with the Clear Coat Collage Technique (June 2009 issue of the Technique Junkie Newsletter). The owner of Stamp Attack is Carol Clements, a long-time TJ subscriber. She would like to offer you a special deal: Anything you order on her site this week is 10% off AND you have free postage! To take Carol up on her offer, simply email your order to her at craftyccc@googlemail.com , mention the code TJ986 in your email to her, and she will send a Paypal invoice direct to you. It couldn't be simpler! To win this set and card, simply leave a comment by Sunday, July 19th at midnight. The winner will be selected Monday July 20th. Make sure that you leave enough information so that I can contact you to let you know you won. Just a reminder that Blogger does NOT leave me your email address. A great way to do this is to leave your email address in a spelled-out way, such as "p huntoon at optonline dot net." I will use my handy random number generator to pick the winning entry. You do NOT need to be a TJ subscriber to win. Good Luck! Congratulation to Karen Deerborn for winning this giveaway! P.S. 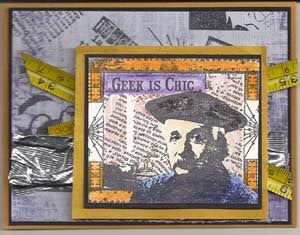 Look for Stamp Attack UK stamps in the upcoming issue of RubberStamp Madness this month, too. I feature these stamps in the article I did for my Tips and Technique Column for using spray starch. 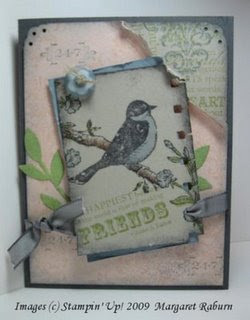 This was just a quick little card I made for a friend of mind when she lent this set to me last month. It uses Stampin' Up! 's Kind and Caring Thoughts set with the Depth of Field Technique from the June 2009 issue of the TJ Newsletter. Some friend I am! I borrowed the set, then left the index print sheet on my stamping desk. I returned this set to her in mid-June -- and yet I still have the index print! Oh well, I will have to just have to send her ANOTHER card! CASE: Copy and "Steal" Everything. That was today's Blogger's Challenge. We were charged with CASE-ing another Blogger's Challenge member. 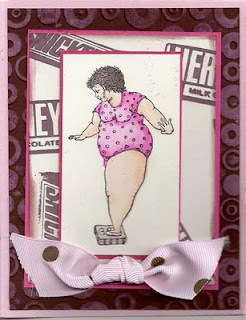 I chose to use a card from Margaret Raburn as my inspirational CASE. A little about Margaret: I have known her for at least 8 or 9 years online. 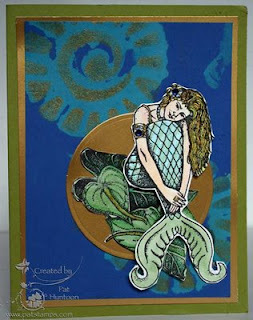 In addition to her wonderful stamping talent, I find her to be humble, sweet and giving. It is my HONOR to CASE her. I think that I haven't done her justice! When I see the cards side-by-side like this, Margaret's certainly is far superior. Beautiful work, Margaret! Make sure to check out the other Blogger Challenge cards -- click on the logo on my sidebar to see all the challenge participants. This is a new release from Sweet 'n Sassy, and can be found HERE on their site. Note that SNS is also having a Christmas in July Sale, too! For the entire month of July, the Christmas & Winter stamp sets are 15% off!But the fun doesn't stop there! 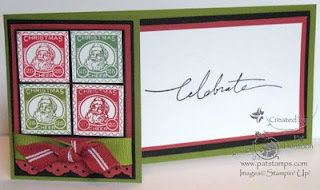 When you spend $25 in Christmas & Winter stamps, you will receive a FREE Holiday Greetings stamp set. Tell her you found out about it on TJ : ) Oh -- and don't forget that TJ members receive a 10% discount, too, with the code iluvtjn. In addition to the stamp set, you will receive the card above. 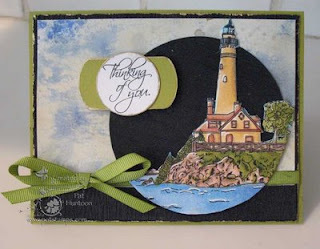 This card features the Lighthouse colored with Copics, then layered over a piece of Black ruche paper from The Paper Temptress. This is on top of a piece prepared with the Metallic Alcohol Roll technique from the October 2007 issue of the Technique Junkie Newsletter (CD6, for those of you who have them!) . To win this set and card, simply leave a comment by Sunday, July 12th at midnight. The winner will be selected Monday July 13th. Make sure that you leave enough information so that I can contact you to let you know you won. Just a reminder that Blogger does NOT leave me your email address. A great way to do this is to leave your email address in a spelled-out way, such as "p huntoon at optonline dot net." I will use my handy random number generator to pick the winning entry. You do NOT need to be a TJ subscriber to win. Good Luck! Congratulations, Frieda F! You are the lucky winner of these stamps -- enjoy! Today's Blogger's challenge was to create something Red, White and Blue. Unfortunately, I am at the bottom of an inspiration hole. I have a deadline Monday for submitting to a magazine I write for and I need to make one more sample for them...and everything I made yesterday hit the trash. Today I woke up thinking I was inspired -- I thought using the sparkle flower from SU's Good Friend set would make a great firework explosion. Alas, I am rushed -- DH wants to paint the kitchen today and I need to go pick out paint colors. I do have to say, in my defense, that the sparkle thingy does look like fireworks. And the red paper in the background, from The Paper Temptress, looks great. 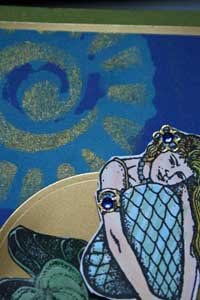 I originally intended to make this a Beaded Window card, too (December 2005 issue of the Technique Junkie Newsletter). I couldn't find any white floss (again, hurried) so I strung my beads on tan -- and when I laid them down, they just looked plain ol' cruddy. Then I dropped the string of beads all over my floor... I also wanted to put a more current "Celebrate" word in there, from SU, but all I could find was this old retired one....I think that threw me off further. 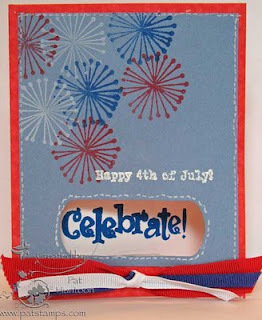 The "Happy 4th of July" saying is from Artistic Outpost. So my card became a drywall-stitched card (April 2009 issue of TJNL). And don't look too close, because it is not a great one at that! C'est la vie. It is only a card!!! Happy 4th of July to you! A Shopping Spree for YOU! Who doesn't love a shopping spree? I know I do! And today's giveaway is for a $20.00 gift certificate from The Paper Temptress! 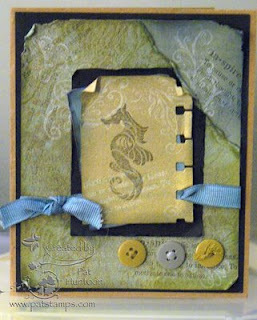 Our card today was made using the Twinkled Stencils Technique (from the June 2009 Technique Junkie Newsletter). The Mermaid and Flora (from Rubber Stamp Plantation) were colored with Copics, and I added little sticker and crystal details to her hair, armband, and ring. I popped this on a piece of Gold Metallic Paper (from The Paper Temptress, of course!). 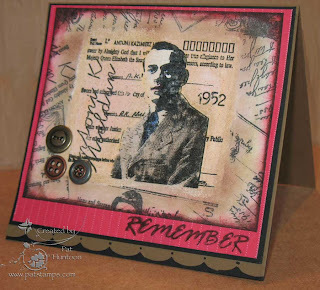 The Twinkled Stencil background is also layered on this luxurious paper! I took a closer picture from the side so that you can see the paper and details better. One Lucky winner today will be awarded a $20.00 gift certificate (along with the card above) to spend at will from the Paper Temptress website. There are so many wonderful papers to choose from! To enter this giveaway, leave me a comment and let me know which paper from The Paper Temptress site is your favorite, or which you would like to try. Comments should be left on this blog by midnight Sunday July 5th. Make sure that you leave enough information so that I can contact you to let you know you won. Just a reminder that Blogger does NOT leave me your email address. A great way to do this is to leave your email address in a spelled-out way, such as "p huntoon at optonline dot net." I will use my handy random number generator to pick the winning entry. You do NOT need to be a TJ subscriber to win. Good Luck! congratulations to Nelda D, the winner of this gift certificate and card!